Clarke, however, does little to dispel Harris’s sense that there is anxiety beneath the confident assertions about the campaign “going extremely well”. Polls that suggest that it could be a very tight race between Labour and the SNP in North Lanarkshire are “inaccurate”, Clarke says, hinting at a nefarious stitch-up between “the pollsters” and “the media”. But the SNP posters in back windows of cars on the edge of town are testament to a different reality, one that is at once both far more prosaic and far more incendiary. The residents of Coatbridge’s pebbledash-studded terraced houses and vertiginous multi-storey flats have voted Labour en masse for decades. In 2005, Clarke’s Coatbridge, Chryston and Bellshill seat was the safest in all of Britain. Last time out, the one-time shadow Scottish secretary polled 67 per cent of the vote. Those days are over. The SNP are now a serious challenge to Labour’s dominance. North Lanarkshire was one of just four councils in Scotland that voted Yes. In the electoral area encompassing Coatbridge, the result was decisively in favour of independence. The day after the referendum, retired schoolteacher Eddie Hagerty organised a party in his house. Along with friends made during the long campaign he decided to form a community group “to improve the quality of life in the town”. “We decided we had won in Coatbridge so we were going to keep that going in Coatbridge,” Hagerty says when we meet on the pedestrianised main street. He wears a bright yellow high-vis jacket with “Stronger for Scotland” printed on the reverse. Hagerty used to vote Labour – “once” – but is now firmly behind the SNP. The local party has gone from 120 to 1300 since the referendum. True, Coatbridge has seen better days. The Iron Burgh’s mighty works, and the jobs they provided, are long gone. The scars of the bleak Thatcher years are all too visible. Main Street is pockmarked with “To Let” signs. Business seems brisk in the bookies and the pubs, but the few bank holiday shoppers are outnumbered by SNP activists, toting stickers, leaflets and even lollipops. All sing from the same hymn sheet: Only the SNP can save the working-class soul abandoned by Labour. Boswell has the look of a used car salesman but that seems to be just about the only job he has not done. He has worked everywhere from Hong Kong and Egypt to the Falklands. (“I’m under the Official Secrets Act,” he says with a smile.) For more than a decade his business has been oil and gas. After organising the Yes campaign in Aberdeenshire West, Boswell decided to take a run at the Westminster seat in his hometown. On September 19, Alexandra McArthur woke up and did something she had never done before. She joined a political party. “I’d never been as politically involved as now,” McArthur says, twirling a miniature yellow SNP windmill in her hand while her son, Daniel, plays outside the busy store on the main street. I ask where the Labour equivalent is. McArthur laughs. There doesn’t seem to be one. Incumbency, however, could be a major factor tomorrow. Clarke is well known across the constituency, held in high esteem by many for his role in negotiating pay settlements for workers in Ravenscraig and some of the other plants that shut in the 1980s and 90s. Clarke’s personal vote could yet win the day in what is likely to be a close contest. Coatbridge is sometimes called “Little Ireland”. In the middle of the 19th century, thousands of Irish emigrants arrived in Glasgow, their search for work often ending in North Lanarkshire. At the time, the Glasgow Free Press called Coatbridge and Airdrie “the nearest thing possible to two Irish colonies”. A century-and-a-half on, around 70 per cent of Coatbridge residents claim Irish descent. The town boasts a Gaelic football team, Irish dancing schools, 10 Catholic churches and republican flute bands that march every summer in Belfast. The Irish community and the Labour party were once synonymous, but that bond is weakening. Last year, I attended a referendum debate as part of the Coatbridge St Patrick’s Day festival. Tom Clarke told the packed hall beside the local church that leaving the UK would make Scotland poorer and more vulnerable. Some cheered, others booed. Beside him a red-faced man started shouting about Tony Blair and Labour’s role in the 2003 invasion of Iraq. That constitutional ambivalence, if anything, is even more pronounced a year later. IN the St Columba Club, horse-racing plays on the television. Tables are filled with betting slips, bookies’ pens, and pints of lager. 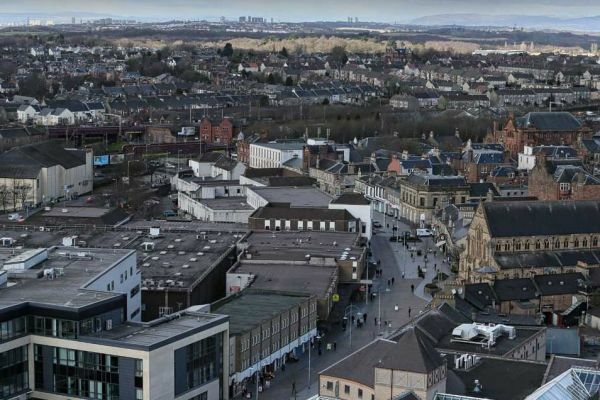 Most of the predominantly older drinkers are backing Tom Clarke, but old certainties about Labour and Coatbridge don’t seem as steadfast any more. Quite what people in Coatbridge, and across Scotland, are voting for – or against – is not exactly clear. Is it about “standing up for Scotland”? Or is it for social justice and a new sense of purpose for long-neglected post-industrial landscapes? Is it about independence? Or punishing the “Red Tories” for joining the toxic Tories during the referendum campaign? One of the most salient features of the polls is that Labour is weakest in seats with the largest majorities, hinting at decades of ossification hiding below the barrel-load of votes that were, as the cliché goes, weighed not counted for so long. Outside the Columba Club, a group of men stand puffing on e-cigarettes and squinting in the afternoon sun. They are all keen to talk, giddily shouting over each other. Tom Clarke’s campaign slogan – “there is hardly a family in is this constituency that I haven’t helped” – does not go down well. One man in particular is anxious to get his point across. A few weeks earlier, he says, Labour came campaigning in his neighbourhood. “All of a sudden this guy from out of the ashes appeared. Tom Clarke. I hadn’t seen him in 20 years.” The rest of the group all laugh.